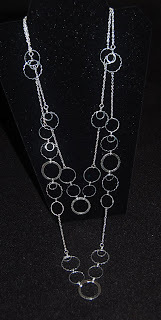 After making a silver plated double chain necklace using the Beadalon links and connectors, I decided that it would make a good base for a lei. The chain necklace instructions will appear on our craft club website (http://www.bfcraftclub.com/). Using white gauze ribbon, I tied a daisy garland (Sierra Pacific) onto the chain necklace wrapping around twice and filling in with extra bows. It actually might be better to leave the back of the neclace (section with the clasp) unflowered so that the necklace/lei can be put on more easily. Like the glass flower wrist-lei, this project is a way to make a lei that will last beyond graduation night. 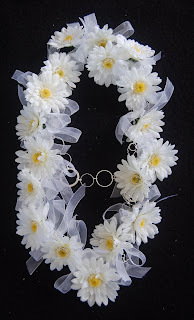 Be sure to attach a card to the lei telling the graduate to untie the bows to remove the daisies and use the chain as a necklace. Oh, in case you're wondering about the orange glass dish behind the glass flower bracelet, it is a carnival glass piece that I purchased on my last antique hunt. I think it is a vintage piece from the early 1900's made by one of the well-known glass companies of the day. The irridescent color comes from the chemicals that were sprayed on the hot glass. This piece of pressed glass was formed in a mold that has a pattern name of 'holly berry' and the orange glass is listed as marigold. As I have commented before, I feel giving flower leis at graduation a sad waste of effort and money because the graduates get such an overload of leis at one time that they cannot possibly appreciate them. Therefore this year I again have designed what I call a wrist-lei bracelet. 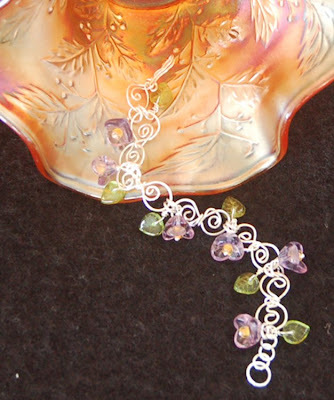 This year's writst lei is fabricated out of handmade sterling silver figure-8 links and glass flowers and leaves. This is a simple-to-make piece which should not take more time than a flower lei to create but which should forever recall for the recipient lifetime memories of their graduation. I will post the instructions for this project on the Ben Franklin Crafts website (http://www.bfcraftclub.com/) as soon as possible. For the male graduates I suppose a graduation gift of money in a handmade card is still the best solution. Anyone have some clever non-lei graduation gifts that are easy to craft, not pricey, and useful? 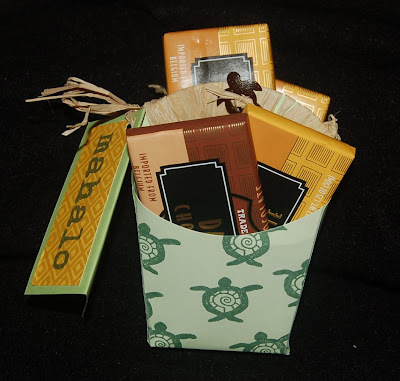 Our friends at Stacey's Pets in Hilo often babysit our turtles when we travel so I wanted to make a cute presentation of some 'thank you' chocolates (nothing says thank you more than chocolate....right?). Recently, I saw (on Cheryl Miyashiro's Life is Sweet blog) a clever use of the french fry box made from the Sizzix die cutter. I think iit was her site but I may be mistaken. Anyway, two boxes were cut and assembled then taped back to back. This gives the boxes stability to stand up and provides more room for goodies. I used a graphic stamp of a turtle by Rubber Stamp Plantation and Brilliance ivy green ink on the unassembled boxes. (The stamp is old so the maker's name rubbed off and I'm not 100% certain it is a RSP product.) After taping the boxes together, rafia was wound around the handle and a coconut shell turtle button was tied on. I think this local-looking goodie box would make good graduation party favors or teacher thank you gifts. I just returned from a trip to the big rock. While there we spent some time with our older son and he gave me a very funny Mother's Day card. 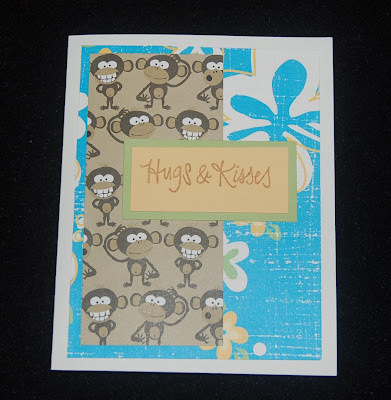 Later during the trip I saw some monkey scrapbook paper that reminded me of the monkey card my monkey boy gave me. Of course I had to buy a couple of sheets and of course I now wish I had purchased more than two....sigh! Before I left on my trip, I bought the Sizzix die cutter that makes the mechanism for a spinning pop-up (for use in a card). 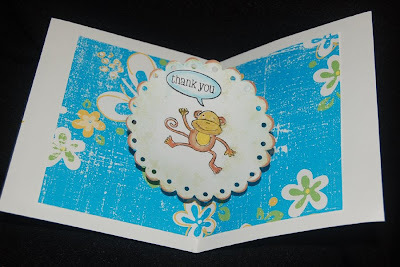 Since I wanted to make a quick thank you card for my son, I thought that this would be a good opportunity to try out my new 'toy' and use the funny monkey paper. Shown here is the resulting card. I kept the front of the card simple so that the inside would be more surprising. For the scalloped inner circle I used the see-through Sizzix die cutter. The 3-1/2" circle will require at least a 5" card blank so the circle won't show when the card is closed. There are many cute papers with animal prints so you don't have to use a monkey print. You can always use a monkey rubber stamp to make your own monkey paper if you do want monkey paper and can't find any. The rubber stamp used inside the card is from Hero Arts. Initially, assembling the pop-up requires some reading of instructions, but it is not very difficult. I think having a pop-up cutter allows me to quickly put together impressive cards for any occasion. 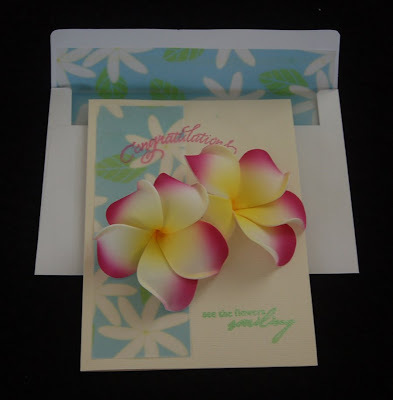 Since I usually give graduation cards with money, I thought I could attach the foam plumerias to my card to give it a flower lei feeling. I also found the printed flower velllum paper (Allure Paper) at Ben Franklin Crafts. There are many tropical themed cards and vellum paper in this line of stationery. The card blank used was from American Crafts, but the envelopes that came in this package should have been cream colored like the card blanks. I lined the envelope with the same vellum used on the card so that it would be a bit more elegant. Vellum tape was used behind the floral vellum and Fabri-Tac was used to secure the plumerias. The word 'congratulations' was embossed so that the ink would not smudge on the vellum. The words 'see the flowers smiling' came from a Hero Arts clear stamp set. I think the sentiment is appropriate for graduation celebrations and is something that we should all train our hearts and minds to do. Last week I saw a cute mini-purse box project on Martha Stewart's TV show. I thought it was the perfect box to enclose a some handmade earrings. The template was on the MS website, but I thought that I could adapt the Sizzix bag with a scallop flap. I did it and was very proud of my cleverness until I saw that there was a Sizzix die cutter for the very same project, a mini-purse box! Oh well, I guess great minds think alike ( lol). 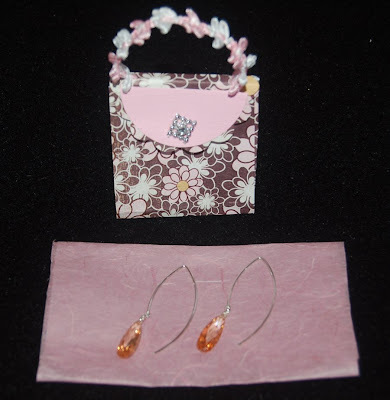 Anyway, the purse box I made did turn out sweet and is just right for the earrings. I used elliptical ear wires and champagne colored teardrop crystals (Imagine It) for the modern looking earrings. The crystals were attached with 26 gauge sterling wire in a figure 8 wire wrap method. Actually, the box took longer to make than the earrings. Next time I need a purse box, I will use the Sizzix die cutter I bought today with my 40% off coupon. What did you buy? It's been a very uncreative week for me because of a cold that is not horrible but very tiring. No, I don't think it is swine flu (also known by the politically correct name 'H1N1 virus'). Despite the lack of anything to blog, I felt I needed to remind you to use the Ben Franklin Crafts 40% off coupon (for one non-sale item) this weekend. The coupon was in the Ben Franklin Crafts sale flyer that came in the local newspaper. Also, if you haven't visited our craft website (www.bfcraftclub.com) recently, please take the time to read the latest newsletter. Because we realize that website readers don't care to read pages and pages of information, we are trying to offer the newsletter in a modified form more often. This portion of issue #37 is about jewelry making. Included in this newsletter is a project that you might like to make for Mother's Day (Don't forget it's this Sunday!). I'm almost over my cold so I'll try to get some graduation projects going for this blog site. (I wrote this post before seeing the latest Joy of Crafting, so I guess I should have asked Joy about the washi tape.) Recently while shopping at Ben Franklin Crafts I discovered two new products from Kodomo Inc. (a Japan based company). This company is now manufacturing small clear stamp sets. Most of them are Japanese themed sets and many have a block print look. My favorite ones are the detailed owl set and the cappuccino coffee set. Also from this company are washi tape sets. There are three complimentary colored tapes in a package. I'm not sure why this tape is called washi but it may be because it can be used on paper and repositioned easily without damaging the paper (which would make it useful to hold down stencils for embossing or coloring images). The tape is easily torn or cut and can be stamped with most inks. Because the tape is a bit slick the ink takes a while to dry, but you can hurry it along with a heat gun. 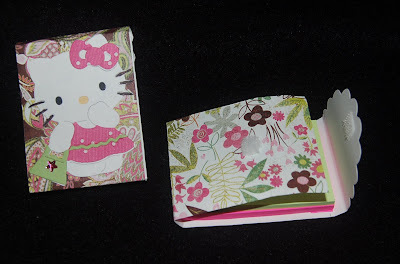 Shown here are two quickie cards I made using the washi tape and the Kodomo clear stamps. The words, "Hi', 'Friend', and 'Thinking of You' are from a Stampedous clear stamp set. I hope that you will try these new products because I'm sure that they will inspire your creativity. I've eaten oatmeal for three mornings in a row. It's healthy but I'm really trying to empty out the cylinder shaped box so that I can use it for a project. Crafting and recycling just seem to go hand in hand. Check back for an update of what I create with the box. Have you ever noticed that you can rarely ever find a scrap of paper in your purse when you need to write something down? I've seen the cute note pads with magnetic closures selling near cash registers but I think that they are too big for my little/crowded purse and I'm always afraid the magnets will erase something on my credit cards. Anyway, I've designed a mini Post-it note pad for my purse and I thought you might like to make one too (or several for party favors, co-workers, special tips, etc.). I started with the Sizzix die cutter for the small bag with the scallop edged flap. I cut out only the main piece (center of the bag) from a printed Basic Grey card stock. I measured 8-1/4" from the scalloped edge and cut off the rest of the piece. Next I wrapped the piece around a 2"x3" post-it note pad ignoring the fold lines on the die cut and creasing where necessary. (You can fold at approximately 1-1/2" (from the scalloped end), 3/8", 3", and 3/8" but the measurements will depend on the thickness of your post-it pad.) If you cannot find a 2"x3" Post-it pad you can easily use a ruler and craft knife to slice off 1" from a standard 3"x3" pad. Next I used the Hello Kitty Sizzlet cutter to do the Mimmy image with the purse (appropritate for a shopping list note pad). The dress and bow were cut from white core cardstock that was first impress with dots ( Sizzix birthday texture folder set) and then sanded. I find it easier to marker in the whiskers, glue small papers behind the eyes and nose and glue the purse, bow and dress to the main white Mimmy. (The Martha Stewart ballpoint tip glue pen works marvelously for gluing teeny tiny pieces.) Then the whole decorated Mimmy is run through a Xyron to make it into a sticker. After adhering the sticker I cut little squares of adhesive backed Velcro and attached them to the notepad cover to form a closure. I hope you try this project and have a happy week crafting.